I have been involved in networking with other youth pastors and youth ministries for as long as I have been involved in professional Youth Ministry. I've been a network coordinator for the past two years or so for the National Network of Youth Ministries which has been a huge support and blessing for us in San Diego region (you should join or donate!) and networking has quickly emerged as one of my major passions in ministry. I love to see churches come together, youth pastors support one another, ministries helping other ministries, and people sharing common ground to serve a common purpose--reaching students with the fresh word of God's love. I've been blessed to be a part of a pretty healthy network in Ramona and another very healthy one (under the coordinatorship of Wes Trevor) in Escondido/San Marcos. It's not something you see all the time or in every community. From what I hear, it's actually quite rare to have a strong sense of commonality shared among youth ministries in a single community. If this sort of thing is really such a rare thing, it's just too bad. There are actually several good reasons behind having a strong network in a community. In Luke chapter 9, Jesus and John have a short, two-line conversation. John says to Jesus, "we saw someone driving out demons in your name and we tried to stop him, because he is not one of us." Perhaps John thought he and his ministry team should be the only ones serving Christ. Jesus said, "do not stop him... for whoever is not against you is for you.” Jesus' response gives us a hint toward his theology of the Church. He didn't assume that his group was the only group doing things right. Jesus told a bunch of stories. One of those stories, found in Luke 14:15-23, is about a banquet to which all sorts of people get invited--people literally right off the streets. He was passionate about creating and finding common ground and inviting all sorts of people to the table. Throughout Jesus' ministry, he drew people together. He drew people who wouldn't normally work together, he drew people that nobody else wanted to hang out with let alone do ministry with, he didn't have an ounce of elitism about him. Jesus was all about bringing people together as long as they were willing to follow him, even if they didn't have all the answers and even if they didn't agree on every theological matter. Sure, there were times when he did things with just a few people, perhaps things he knew that he couldn't do with every one of his followers, but Jesus acted out a vision of collaboration, a vision of people serving and helping one another, churches helping churches. Jesus was a servant and he expected his followers to be servants as well. A servant puts their own need to be righter, bigger, or better aside in order to put others first. Jesus had a vision that the Church would be united in him in the same way that he and the Father are united. Just as Christ was a reflection of his Father, or as Paul puts it, "the image of the invisible God" (Colossians 1:15), Jesus prayed that the Church would be a reflection of him to the world. In the book of Genesis we find a series of etiological narratives--stories which offer explanation for how things got to their current state, how things became "normal" to us. For example, if you've ever wondered why a serpent crawls on its belly, the author of Genesis 3:14 offers an explanation. There are less superficial explanations there as well; explanations which offer to us a wonderful starting point for theological and ethical reflection. There are explanations of how sin, struggle, and chaos became the "normal" state of things. It explains truest identity of men and women--that they were created in the image of God and that together in community, they'd reflect God's image, God's character, and God's love into the world. There is an explanation for why people are divided by cultural and language barriers as well. The author of Genesis offers a narrative explanation at the heart of human divisions: the Tower of Babel. In the story of the Tower of Babel, the people of the world, having been distorted and distracted by the curse of sin and death, decided to build a tower which would reach the heavens. They built this tower in their pride, and in their foolish self interest they tried to reach God through their own achievement. The consequence of this misguided group project was failure and they suffered division. They began speaking other languages, they began separating from one another because of their inability to understand their neighbors. The world was divided and we have come to know this division as the standard, the norm, and the Church has accepted such division within itself--divisions based on misunderstanding, divisions based on cultural and stylistic differences, even divisions based on a mi guided sense of our own ability to achieve without the help of other churches. The author of the book of Acts, however, observed God doing something radically different. We don't often connect the story found in Acts chapter 2 with the story of the Tower of Babel but it may have been the first direct connection in the mind of the author and his original readers. In the midst of the division in the world, the church was gathered, "they were all together in one place," they were all filled with God's Spirit and began speaking in "other languages." But these languages, unlike the ones from the Babel story, didn't create division. On the contrary it says, "a crowd came together in bewilderment because each one heard their own language being spoken." This vision is of a church which undoes the division in the world and begins to speak the same language... even in different languages. This mysterious story offers a vision of a united Church (united by the Holy Spirit), a Church which transcends the barriers serving Christ together, putting their differences aside for the sake of God's kingdom. How often are our theological differences simply a matter of language differences? Certainly not all the time, but sometimes it's not so much the theology that divides us, but the language we use. We might be saying the same thing but still we just can't understand each other. Acts offers us the suggestion that the Holy Spirit can set those differences aside and unite us. Even if our language is so different, even if we're saying very different things, the dialogue has begun and the division is being undone. Paul uses this really interesting phrase, "The Body of Christ," to describe the Church. He does it in several passages, the most notable of which is 1 Corinthians 12:27 where he says, "Now you are the body of Christ, and each one of you is a part of it." So Paul says this to a church in Corinth, a particular church in a particular community. But Paul also spoke this way about other churches. It wasn't just the church in Corinth that made up the Body of Christ. The Body of Christ was the church in Ephesus and in Colossae--every church made up the body of Christ together. This was Paul's dominant theology of the Church even in books and passages which do not explicitly describe it. The Church is to be of the same mind, of the same body, sharing together in the death and resurrection of Jesus Christ, whether slave or free, male or female, Jew or Gentile. Paul saw many churches, wrote to many churches, but believed in one Church. There is one Church with many congregations. The Church is one body when all its parts decide to come together. For the author of Acts, though there were many languages, there was shared understanding. For Paul, though there were many churches there was one Church. For Jesus, though the flock would be scattered, the prayer was that they'd be united in his service even if they wouldn't normally even hang out. Today, though there are many congregations, there is still one church, one Body of Christ unified in all its diversity of thought and expression. Now these two principals--the oneness of the Church which is the Body of Christ and creating common ground as servants of Christ--are deeply rooted in the scriptures and they are foundational for constructing any theology concerning the things we do and the reasons we gather. If we plan on teaching any theology of the church to our students, if we're not going to omit that concept from our teaching and discipling teenagers, if we believe that the Body of Christ is still alive and well and if we believe that "whoever is not against you is for you," then we simply must put it into action. You can talk to students all you want about service and about being the Body of Christ, but if youth workers aren't practicing it and if students never get a chance to experience it, then those words will fall dead on their ears. Networking with other churches is a theological task, a biblical task. It is the task of setting aside the differences and uniting in service to Christ and support for one another, even if our language about him is different and even if we're just sure that we could do it on our own. The SpiritualKoinonia is a Greek term used in the New Testament to describe communities of mutual sharing, communities of shared identity, of understanding, of support, and of solidarity. It is perhaps the best one word description of that for which Paul uses the term "Body of Christ." Koinonia overcomes social distinctions and opens space in which people are understood, heard, connected, and loved. It is a community of interdependence, not independence. We weren't made to do things on our own and yet the concept of independence has hijacked our imagination for doing ministry.We were not created to be independent from God or from one another, rather we need deep spiritual connection if we are to become who we were created to be and saved to be through Christ. The vast majority of churches have realized, at one level or another, that they need the support of other churches, indeed, they need a shared identity with other churches in order to function and to program in a way that opens space for spiritual nourishment and an atmosphere for authentic worship. Many of these churches welcome the concept of networking, even if only in the context of denominational affiliation. But still other churches run just fine on their own. They are quite independent. Some churches have their own bus or buses. Some churches have more than one room that their youth ministry can use on a given night. Some churches have a full pastoral staff who support one another and are expert programmers and designers for ministry. Some churches really don't think that they need networks. And the truth may be that they don't. They may not need the network but that doesn't mean that the network doesn't need them. Some churches have to work and actually humble themselves in order to embrace the true interdependence of koinonia. It's easy for our world to become the world, when we're in self-sufficient and independent churches. The small churches, however, sometimes suffer from the same sense of spiritual independence. Sometimes this is precisely the reason that they remain a small church. Churches of all sizes are needed by each other and churches of all sizes have a spiritual need, the need for koinonia, to reach out to one another, share with one another and listen to one another. The affect of the church body without this sort of connection with other churches is that they become an island. The affect on the youth worker in these churches is often even more detrimental. The need to be understood is not a superficial or an artificial need. It doesn't take very long working with adolescents to see this need in their lives and most would agree that in order to show love to students, it's important to listen to them, hear their stories, meet them where they are and understand them. Many youth workers have reflected on this but few have reflected on their own need to be understood. Perhaps one of the reasons that the average youth worker only lasts a year or less in their vocation is because they've suppressed this need and have burst at the seams.We all need to be understood, we all need to be heard and we need it in specific ways. Hopefully, there is not one youth worker who feels completely and utterly misunderstood and unheard in their own congregation (I am aware, however, that this is the reality for far too many youth workers). But even in congregations where we are otherwise welcomed, understood, and heard in most aspects of our lives, it is rare (especially in smaller churches) for youth workers to have a sufficient community of people in their congregation who are equally passionate about youth ministry and who truly understand and hear the voice of the youth worker. Even Senior Pastors who think that they have to capacity to support their youth workers are most often greatly mistaken. It is rare for us to experience much koinonia in the area of youth ministry unless we are in community with other youth workers, with others who are going and have gone through that which we are going through. Now this is not about how well the ministry functions and it's not even about the youth worker's ability. It's about the spiritual need of the youth worker. This need is too often ignored in congregations and too often ignored by Pastors. Solid networking can help fulfill this spiritual need. Though some Pastors might worry about the risk of sharing their youth pastor/youth workers with anyone, youth workers need to be in community with one another where they can table the theological disagreements for the sake of spiritual nourishment. Youth workers need to share their stories with one another, they need to share their hope and the fear with one another. Networks, in this way, can actually save, and have saved, youth workers from leaving their ministries and concluding that they just couldn't do it anymore. I've heard more than one story of youth workers who said that their networks kept them in the game. When this happens it is a victory for churches, a victory for the Church, and the spiritual victory of koinonia. A couple of years ago, a church in San Diego County, with a tradition of having strong youth ministries and solid youth workers, suffered the loss of their High School Youth Pastor who had been there for more than eight years (long enough for the students to get attached). He had received the call to serve in another church in central California and so the church decided to let him go quite abruptly and leave his intern in charge until they could fill the position. The intern youth worker now had a sizable youth ministry to handle while it grieved the loss of their beloved Youth Pastor. The intern was good at what she did, the students loved her and she was very familiar with the dynamics of the church but she still felt in over her head. She knew she needed help so she turned to her local network. During the interim period, youth pastors from other churches--everything from Congregational churches to Calvary Chapels--stepped in to help out. The network supported her, helped her teach, and even helped program the ministry. When the new Youth Pastor was hired, he came into a healthy and vibrant youth ministry which was ready to embrace his direction and the network stepped away. That Youth Pastor then became a big part of his local network too. In the Ramona community, every four months or so, youth ministries from all over town come together for a night of worship called Youth Unite. Churches from different traditions, backgrounds, and perspectives, from various places on the theological spectrum, put their differences aside and focus on what they do have in common, what they can do together. Students and youth workers from a variety of churches get involved for a night where we simply worship God together and challenge one another to be the Body of Christ for the world. It has become evident that, as this is becoming regular practice in Ramona, students are becoming more aware of the Church and its purpose. 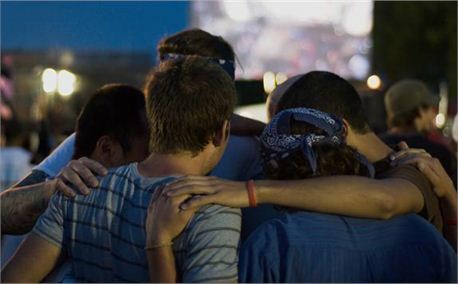 Students are connecting their faith and their worship with action and the youth ministries have grown more vibrant in the process. There are endless stories of churches sharing transportation with one another, lodging together at events, serving together in service projects, worshiping together, supporting each other spiritually and even financially, and collaborating for the kingdom of God as one Body of Christ. This kind of support makes a difference. Networking makes these sorts of stories possible. Networks are making the Church visible in the world. Now, the truth is, networking isn't always easy and as churches prayerfully discern, beginning with what we can do together in our differences, they'll discover that there are things we can do with some churches that we can't do with others. Having a baptism party, for example, probably isn't a good place for Baptists and Lutherans to start networking together. A study in Revelation, for example, might be an unhealthy starting point for a Calvary Chapel and a United Methodist ministry. Some churches may not ever want to collaborate with some other churches. Not everyone will always love the idea of supporting and praying for one another. But if we start with the things we can't do together its likely that we'll never get to the things we can do together. It begins with an open heart and a willing spirit. The next step is making a phone call, meeting for coffee, or just putting out the invitation to begin together; praying together and sharing stories together. Collaborative ministry and depth of sharing begin with trust and connection and a conviction that there are many congregations but there is, in fact, one church.